You could be feeling frustrated today over something that’s taking longer to manifest than you’d hoped for. While the urge to push ahead anyway and move things at a faster pace will be strong, the Seven of Pentacles encourages you to do otherwise. In this version of the card we see a little witch figure standing before a tree under the light of a New Moon. Perhaps she needs some of the tree’s life essence to cast a spell. But she pokes at it with her wand and draws blood. We can see all seven pentacles growing on the limbs of the tree, but there are no leaves and no flowers: they too are not quite ripe for the picking. Think about the things in your own life that need still need time to develop and mature. It could be a promotion that feels like it’s taking too long to materialize. It could be a relationship that’s not moving forward as quickly as you’d like. Or you may be just feeling frustrated with the pace things are moving in your day to day life. The Seven of Pentacles refers to a need for patience, planning and perseverance, especially in areas you’ve already invested your time and energy. It speaks of the need to allow things to unfold on their own, rather than trying to force them along prematurely. You already know that when you try to rush something to completion before its time you run the risk of losing all the momentum you’ve already gained. So for today, step back and focus on how far you’ve come rather than allowing yourself to wallow in frustration over how much is left to be done. 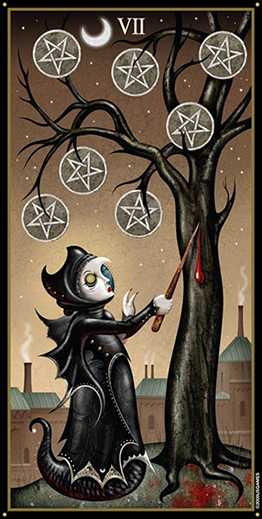 The card used for today’s tarotscope — Seven of Pentacles — is part of the Deviant Moon Tarot, designed and created by Patrick Valenza. There is also a borderless version of these cards out now. For more information on his deck and to purchase them, please visit the Deviant Moon Tarot website. Please also check out and “like” this deck’s facebook fan page.